I took the GB for a haircut this morning. This was only her second professional one; I've done trims here and there as well. This was the most we'd ever cut, though. Her hair was getting much too long and it was getting difficult to wash, even worse to comb out the tangles after washing. To say this process lacked enjoyability for both of us would be a severe understatement. So we decided, mutually, to have a haircut. Her hair was nearly down to her waist and now it's just below her shoulders. The hairstylist cut off about three inches. Her hair is much neater now and I'm feeling confident about tonight's bath and hair-washing. I think we can handle this better now. I wasn't necessarily sad about the actual hair-cutting. It wasn't the first time and I did save a lock of hair after her first real haircut. The GB's hair life has been entertaining, for me. She was born with just a little bit of sandy blond hair which all fell out by the time she was about four months old. Then she was totally bald for a long time. The Bear said she looked like Lex Luthor. Then her hair slowly began to grow in, white at first, and has darkened to a sandy color again, just like her father's and brother's hair. In fact, they all have the same hair-growth pattern too. Pin-straight, fine hair, lots of cowlicks, a natural part on the left side and the front section grows straight down over the face. No problem on a boy, just keep it short. On a girl, this translates to keeping the hair back by any means necessary. But the fineness of this hair means that very few hair accessories will stay in for long. We tried every kind of band, tie and clip on the market, I think. And while her hair is still very slippery, it's also thick enough that some items are just too small now. As part of the haircut milestone, we agreed that we would part with the "baby" hair items and buy some new ones. This afternoon we spent some time organizing. I keep all of her hair items in a caddy on top of her dresser. She was surprisingly cooperative, but we had gone to the store first to pick out the new assortment, which provided a fair amount of incentive. We filled a good portion of a gallon-size storage bag with "baby" hair things. I think I'll see if any friends might like to have them for their daughters. We arranged the new clips and barrettes, stronger and bigger for a big girl's hair, very neatly in her caddy. We're keeping some of the old things, like the elastic bands, which are good for ponytails and pigtails. She has plastic headbands too, but we keep those in a drawer. I felt nostalgic for our very first forays into hair decoration, so I decided to keep a couple of things that I felt represented her little-girl hair best. I settled on this clip with a bow attached and these tiny red snap-clips. The bow was the first thing she wore in her hair, at about eight months, and the clips were worn between one and two years; this pair was worn with a red dress in a portrait taken at Christmastime. I put them in a keepsake box in my bedroom. They'll remind me of her baby hair. My feisty, nearly-bald baby girl. Her hair is lovely. The cut gave it body and fullness and the ends look fresh and clean. She's been pondering aloud whether her friends at preschool will notice when they see her tomorrow. I put it back in a bigger clip and admired the way the clip is staying in and keeping her hair neatly back and off her face. 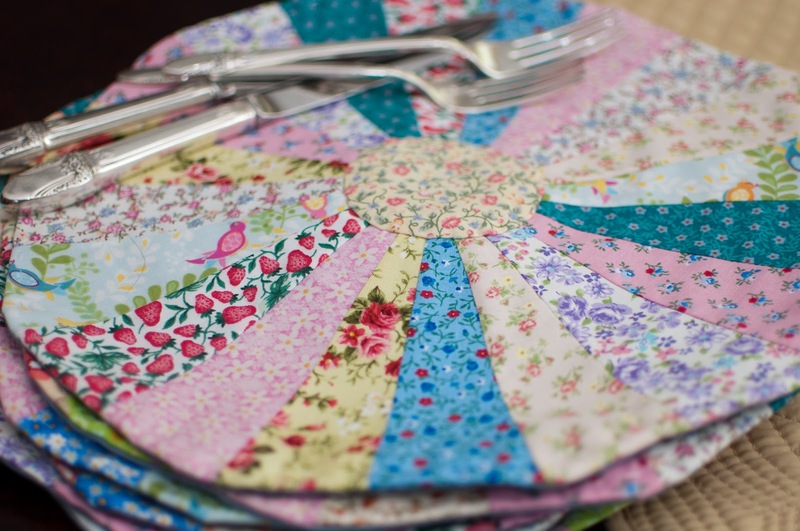 This will be especially helpful at mealtimes. And I have to say I'm a little jealous of her natural highlights, which are easier to see with the front pinned back; grown women pay a lot of money for hair like this. So. It's just a haircut. Hair grows. Children grow. My sentimentality grows...endlessly, it seems. Sometimes, when the stars align just right, and the children are in a (mostly) sustained good mood, and I'm caught up on all the housework, I can spend lots of time doing what I really love to do. It doesn't happen often; I'm usually doing these things in small snatches here and there, but the past few days have been productive and I felt the creative juices flowing! Today will break the cycle, I think. I'm headed to Walmart in a little while after I've taken the GB to school. That place will kill anyone's buzz but I enjoyed it while it lasted. There has been kitchen fun, baking a batch of blondie bars on Sunday afternoon. Full disclosure: they were from a packaged mix, I only had to add egg and melted butter, but they were delicious. I used salted butter, because that's what I had, but I think it only enhanced them. They almost had a salted-caramel kind of taste because of all the brown sugar in them. I went with the directions for "crisp" bars and that worked great; they were like thick chocolate-chip cookies with soft centers. I finished the third quadrant of my Scrappy Trip-Along project. Oh, yes. I think I like it. They can be moved around interchangeably until just the right look is achieved so I have been playing with them a lot, trying to decide what I like. The look will change yet again when I finish the final quadrant. The pattern is beginning to emerge, which makes me both happy and relieved. I'd never tried this quilt design before and I wasn't sure that the look I was going for was the one I would get. But I think it's working. I've decided on a backing for this piece; I'm going to re-purpose an old bedsheet that I've been saving. It's not vintage-old, more like Y2K-old, but it's soft and very durable. And huge, and free, because I already own it. 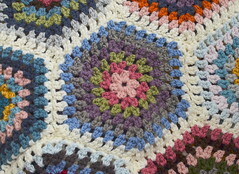 The granny afghan is progressing too. I'm plugging away at it most evenings after the small Bears are in bed. I can make two or three squares in an evening, while I watch something mindless on Netflix. I've had to make a change of plans with this blanket. Most of the yarn I'm using is Hobby Lobby's I Love This Yarn worsted acrylic. I picked the perfect time to use that yarn, it turns out; weeks after I bought it, Hobby Lobby decided to discontinue the yarn they've been selling under that name. I hear that they plan to bring it back under a new manufacturer, to improve it. The local stores, as well as the website, have very few skeins of the old yarn left. Lucky me, the main color for my afghan happens to be one of the colors they don't seem to stock at all anymore. So I've changed gears and I have a new plan for it. It involves fewer squares and a different way of putting it all together. We shall see. I'm still enjoying making the squares themselves. They are easy and definitely have a soothing rhythm to them. I have 50 squares made now, and I need 80 for my new plan. I'm getting there. I'm actually very eager to see what Hobby Lobby decides to do about the yarn. I don't Love This Yarn much myself. As I've said before, it's cheap and makes a sturdy blanket, so it's worth it to me. But I'm starting to move into the I Can Barely Tolerate This Yarn camp at this point. I'm hoping for a significant improvement when they bring in the new line. The crocheting itself is wonderful, though. I really do love to work on my yarny projects, even if the yarn isn't great. I like knowing that I'm making an item that will be well-used by my family and will decorate my home. And I'm doing it inexpensively, which is satisfying. We had more snow yesterday. We woke up to about an inch. The small Bears played in the snow in the afternoon. The wind was bitterly cold all day, unfortunately. It wasn't good snow-playing weather. But it was pretty to look at and we again enjoyed cozy time at home. Sometimes I appreciate the way winter keeps reminding you of home and hearth even when you just want springtime to appear in full force. Sometimes being driven back indoors, to your tea and soup and blankets, is exactly what you need. I've been mother to a little girl for four years now. I still haven't tired of the clothes. I received a shipment of spring clothing for the GB the other day, all brightly-colored tunics and capri pants, and experienced pure glee as I unwrapped them and laid them away in her dresser for the next few weeks until the weather begins to cooperate. I ordered them from Carter's; nothing fancy, just affordable, durable play clothes. It's just so much fun to dress her. Stitch: I bought this acrylic/wool blend baby yarn to make a dress for the Girl Bear, for her to wear next winter. I'll use a pattern I purchased from Alicia Paulson's shop, Rosy Little Things. It's the Mina dress and I think it's totally adorable. Read: I'm currently reading The Chaperone by Laura Moriarty, which is beautifully written. I'm enjoying it very much. In fact, I'm having trouble putting it down. 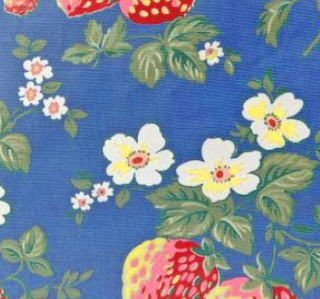 Covet: Right now, I'm into the new Wild Strawberry pattern from Cath Kidston. I especially love the skirt and day bag. Blog: I've been enjoying the blog Made in K-Town. I stumbled across it a few weeks ago. Barbara lives in Germany and she creates beautiful crocheted items and shares tutorials for them too. 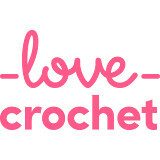 Barbara sometimes features other bloggers and their work; she recently shared an interview she did with Kathryn Vercillo of the Crochet Concupiscence blog, which I also enjoy. Kathryn is also author of the book Crochet Saved My Life. This looks like an interesting read as well. Stitch. Read. Covet. Blog. is an idea I got from the wonderful blog, Christina Lowry Designs. Christina has been posting her own editions and I've enjoyed reading them. She inspired me to do it too. Yesterday morning we woke up to find that it had snowed in the night. There was a good chance of snow in the forecast but it was still a bit surprising. We had two to three inches of snow, which is a fair amount for us. The LB's school was on a two-hour delay and the GB's class was cancelled altogether, as she is in the morning session at her preschool. Even the Bear had a delayed start to his workday. We spent the long morning at home together. Then it was just the three of us until it was time to drive the LB to school. While they stayed warm indoors, I went out to the front yard to take pictures of the snow. We have done a bit of landscaping work in the front yard over the past few months and I've been enjoying the newly open feel and neater appearance of our plants. Most of our property is xeriscaped, to be desert-friendly. I love our plants; we have jasmine, rosemary, lavender, sage, yarrow, yucca and junipers, among others. They're pretty to look at but many of them also smell wonderful, especially when they are wet. The snow was already beginning to melt on pavements and other hard surfaces, including the stones in our courtyard and the path and stairs down to the street. The brick edgings of the yard were also exposed by then. But snow remained on the plants and on our decorative chile pepper ristra by the front door. It was a beautiful snowfall. It was mostly melted by the afternoon and it provided plenty of much-needed moisture. The gutters in the street, the canales on our roof and the arroyo behind us were all flowing with water by late afternoon, and that continues today, thankfully. Back indoors, I joined my small Bears for a little bit of play before it was time to leave. They were in our home office, building a tent out of blankets spread over their kid-sized table and chairs set. 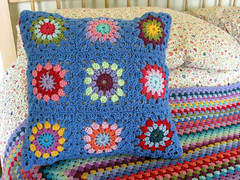 The blankets they used are crocheted. The big striped one was made by the Bear's grandmother when he was child; he slept with it on his bed for years. The little red one was made by my mother-in-law for the GB, a couple of years ago. It's done in a very interesting pineapple motif. She says it was very easy but I'm a little skeptical. The item on the floor to the right of the tent is a woven poncho belonging to the Bear, also made by his mother. The Bear's family is filled with very talented women. It's a lobster and a tropical fish. You can also see just a bit of the green trout behind them. There was also a crab, not visible in this photo. Perhaps this was a camping excursion to a maritime area. I had a little time for my own pursuits too. I'm still working on the granny afghan of yore; I spent some time this week winding my large skeins of yarn into balls which fit into my yarn bag instead of continuing to lug a giant plastic shopping bag around the house with me as I work. I was successful. The yarn now resides in my crocheted Lucy bag and it's a lot easier to move around. It was an unexpectedly long morning at home but it was cozy. The snow is nearly gone today but it's still cold and windy out. The Bear is home because it's his day off. Homemade pizza is planned for our dinner. And yarny time in the very near future for me. I love where I live. It isn't perfect but it's mostly very good. I had a few minutes of downtime while cooking dinner last night. I stood and watched the mountain from the kitchen window. The sun was setting. With spring just around the corner, the sun is setting later. Last night, the colors on the mountain were especially intense. That's probably a function of dust particles in the air, as it was quite windy all afternoon. But it was beautiful anyway. I took my camera outside for a better view. This was at 5:40. The mountain was bright golden orange. By 5:50, it was pink. This color gives the mountain range its name. Sandia means "watermelon" in Spanish. Early settlers thought the mountain resembled watermelon at a certain point during every sunset. Ten minutes after that, the mountain was gray and twilight had fallen, only a thin line of pink on the western horizon. I look forward to long summer evenings observing the mountain from inside the house or the backyard, with or without binoculars. We'll watch the tram cars make their way slowly up and down the slope, glinting in the setting sun. These pale pink tulips on my kitchen table make me really happy. I picked them up at Trader Joe's on Saturday morning when I did some grocery shopping. I love their delicate color. Tulips are one of my favorite flowers and I often gravitate toward very brightly-colored ones but these caught my eye this time. They are sitting in one of my favorite jugs; I received this one as a gift a few years ago when my parents were visiting. The GB was a new baby and it was difficult for me to be away from home for long. My parents wanted to sight-see so the Bear took them out. They found this jug in an antique shop and brought it home for me. As you can see, it's just my taste. I made a delicious dinner on Valentine's Day. I used Barefoot Contessa's recipe for parmesan chicken, which came out really well. It was easy and very tasty. The cheese in the breading crisped nicely. I served it with spaghetti tossed with garlic and olive oil; I stirred some steamed broccoli into the pasta right before serving. This is a recipe enjoyed a lot in my family. Everyone loved their dinner. I think the chicken recipe is a new favorite. I was in Hancock Fabrics last week. They had a small selection of these long, flowy skirts there. This style came in a few colors, including orange, turquoise and white. The orange one caught my attention. I don't typically wear this color but it made me feel so excited for warm weather and being outdoors - flowers, warm breezes, drinks on the patio, dancing in cool grass. I love the detail work on it too; I think the lacy inset is crocheted, and then there are those crystal beads and sequins all over too. This skirt awakens my inner Stevie Nicks. Finally, this is a photo that makes me very happy because it was the result of a very unexpected surprise package I received last week. My friend Rhiannon sent it from the UK, where she and her family have been living for several years for her husband's military service. She is one of my oldest friends; we met in religious education class when we were six years old and remained friends through high school, but then we lost touch. Thanks to Facebook, we reconnected last year and have been enjoying our friendship all over again. Her family is preparing to move to the part of New York where the Bear and I had been living before we moved here, and where the LB was born. Her husband is being stationed there next. I've been trying to help her with real estate tips, school districts, climate information and such. She sent these items to say thank you. The strawberry and cream shortbread is my favorite but those dark chocolate gingers are pretty great too. Everything is good. Surprises are wonderful. Around here, Valentine's Day is fairly low-key. We keep it somewhat simple, exchanging smallish gifts and enjoying each other's company. The Bear is at work and the small Bears had school this morning but we'll all be together again this evening. I had some time this morning to grab coffee with a friend while the small Bears were at school, and then a little while to browse in the fabric store before I needed to pick them up, so I'd say my day has been very nice so far. I buy myself flowers (and candy!) pretty often so my love usually chooses more unusual treasures for me. This year he really surprised me. He (along with the small Bears) gave me a beautiful blown-glass oil lamp which he bought in Weems, a local art gallery. I've never seen anything like it before. I'm in love with it. And him. We gave him a book by an author he loves. He has been into Neal Stephenson for several years and when I saw that he had a new non-fiction book, this collection of essays and other short writings, I knew he would enjoy reading it. I also gave him a dark chocolate tiramisu bar. His favorite dessert is tiramisu (I make it for his birthday most years), so it seemed right. The small Bears will receive their gifts later on when Daddy is home from work. They are being given new swings for their backyard swing-set. I ordered them online and picked them up locally yesterday. Their swing-set was bought second-hand, from a family who had outgrown it, and the swings have been in need of replacement for awhile now. These new swings will be a vast improvement. We're pretty sure these two swinging fanatics are going to like them. Happy Valentine's Day! I hope everyone gets to be with someone they love today. 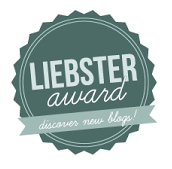 When I read about the Scrappy Trip-Along on several of my favorite blogs, I began thinking I might like to join. 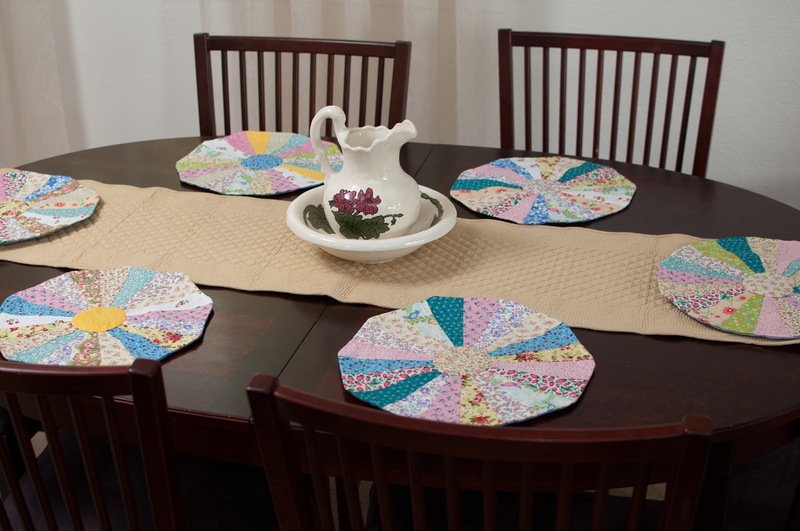 I had been trying to come up with a new quilty project for a little while, with plans to make something for my dining room table. I think I'd like to make another set of Dresdens someday, maybe in a Christmas theme. I considered making square placemats for my Scrappy Trip-Along project, but I have enough placemats for now so I decided to make a small piece to use on my dining room table. It will be sort of a tablecloth but more of a runner or table topper, four feet square when it is done so it won't cover the entire table but it will add some color to the room. This is the way my dining room table looks currently. I have a simple cream-colored, quilted runner (store-bought), simple glass candle holders, cream taper candles and a crystal vase with faux winter berries. Sometimes I also use the ceramic jug-and-bowl set in the photos above; I drew and painted the geraniums on it myself when I was a teenager. I change my candles and flowers with the seasons. I like to use faux flowers here so I don't have to worry that I forgot to water them! The dining room is not often used for eating, really just on holidays. But I like to keep it tidy and decorate it for the seasons. The dining and living rooms are L-shaped and open to one another and we do use the living room a lot, plus both rooms are visible when entering the front door of the house. That gives me incentive for tidiness. I started cutting my fabric for the new item over the weekend and also began sewing. I have now finished one quadrant of my piece. I opted to make mine a little differently than some of the ones I've seen which are being made with quilt blocks that are comprised of squares in a 6x6 arrangement. I am making mine 12x12 because I think a bigger design will have more impact in a smaller finished piece. I'm sewing my squares in strips and then sewing the strips together. I work at the kitchen table, as I do for all of my sewing projects, because that's where I have room to spread out. I love working on a project like this; every part of it feels soothing and rhythmic and peaceful to me. After several hours of piecing and sewing, I had a finished square. Remember the graph-paper design I shared last week? This finished part forms the upper left quadrant of that design. I like the way it looks so far. Maybe a couple of questionable choices, but most of the fabrics seem to work well together and I think it's definitely looking scrappy, which is what I was going for. There are bits in here from all different past projects, including both of the baby quilts I made for my children before they were born. That's one of the things I love best about sewing, as well as having a fabric stash; so many of my fabrics have memories attached to them, places where I have used them before, reasons for choosing them. I haven't been able to find that same attachment to yarn so far, but I'm sure it must happen for many people. 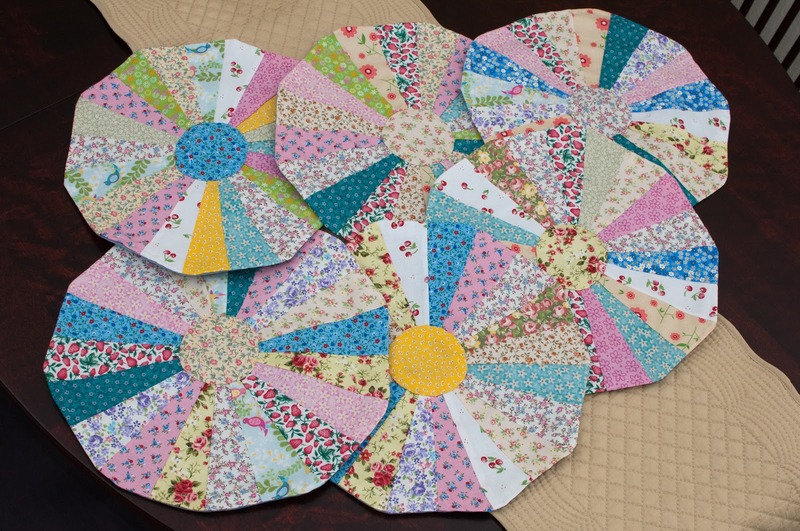 I have the squares cut for the other upper quadrant now too and will begin sewing soon. I prefer to sew in natural light and it's hard to find enough time during the week so I will have to carve out some time with my sewing machine this weekend. Just for fun, here's a comparison of my graph-paper version side-by-side with the real thing. The real one looks better, of course. But the graph really helps me a lot; I can see it taking shape more easily. What you can't see on this graphed design is all the penciled markings where I figured out all the math of this project. It's kind of messy. I'm having fun with it. There are so many amazing examples of this project out there and I feel very inspired to make one of my own. I think it evokes springtime. For the dining room table, I'm thinking pink candles in my little glass holders and small white silk flowers in the vase.